Marius Everhart is something even mages fear — a shadowmancer. His power marks him as cursed, a creature belonging to the Queen of Shadows. Marius escaped her realm with his memories corrupted and his sanity in tatters, managing to live a fragile, lonely existence at the edges of society. Some might call Ayodele Sauveterre delusional. He prefers the term “optimistic”. 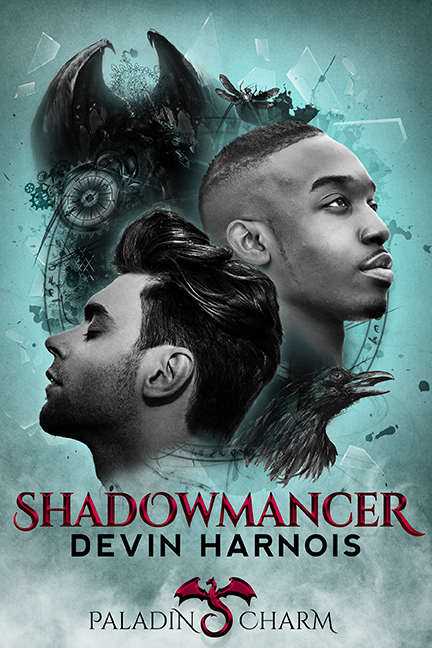 With his homeland in danger from invasion, Ayodele will do anything to protect it, even recruit a shadowmancer. Marius’s incredible power and gentle nature make him a perfect addition to Paladin Charm, a new mage guild dedicated to helping rather than exploiting the non-magical populace. The fact that handsome Marius also warms Ayodele’s bed is a wonderful bonus. With support from Ayodele and his new friends in the guild, Marius begins to heal. He’s also quickly falling for the alluring mage, but Ayodele struggles with what’s forming between them. Past experience left Ayodele flippant but guarded, and Marius’s open honesty unnerves him. As they grow closer, Paladin Charm prepares for a battle with impossible odds. And in the darkness, the Queen of Shadows waits to reclaim Marius and drag him back into a nightmare. Buy now on Amazon. Add it as “To Read” on Goodreads.